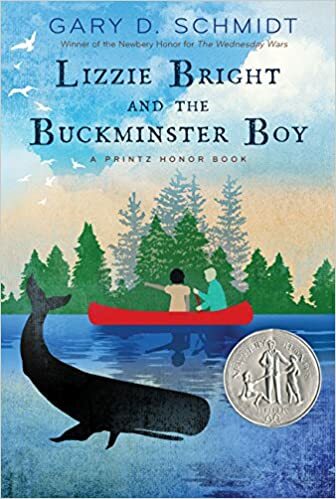 Lizzie Bright and the Buckminster Boy by Gary Schmidt is on the surface a typical new kid on the block book. Turner Buckminster has just moved from Boston to the small community of Phippsburg, Maine in 1911. His father has taken a job as the local pastor. Turner immediately gets into trouble and trouble keeps finding him. He accidentally skips a rock into a neighbor’s fence. He’s caught with his pants down by this same neighbor as he tries to wash blood out of his pants so his parents won’t find out. And he visits Malaga Island, a place where African-Americans live, and befriends a girl named Lizzie Bright Griffin. Turner inherits a house in the town and wants to give it to Lizzie. The community is in an uproar. They force the inhabitants to leave and burn their houses down. Turner, distraught, attacks the sheriff of the town. His father comes to his defense but in the struggle takes a bad fall off a cliff. Lizzie has moved away and Turner is left reeling. Can the soul of a whale help? Newbery Honor Book for 2005. You won’t want to miss this one! Highly recommended. Great historical novel of racial divisions. Themes are timeless.